My church is across the street from the Cascade P-Patch in the South Lake Union area of Seattle. The other day I noticed a "quaint" scene, and I promised myself I would return to sketch it. 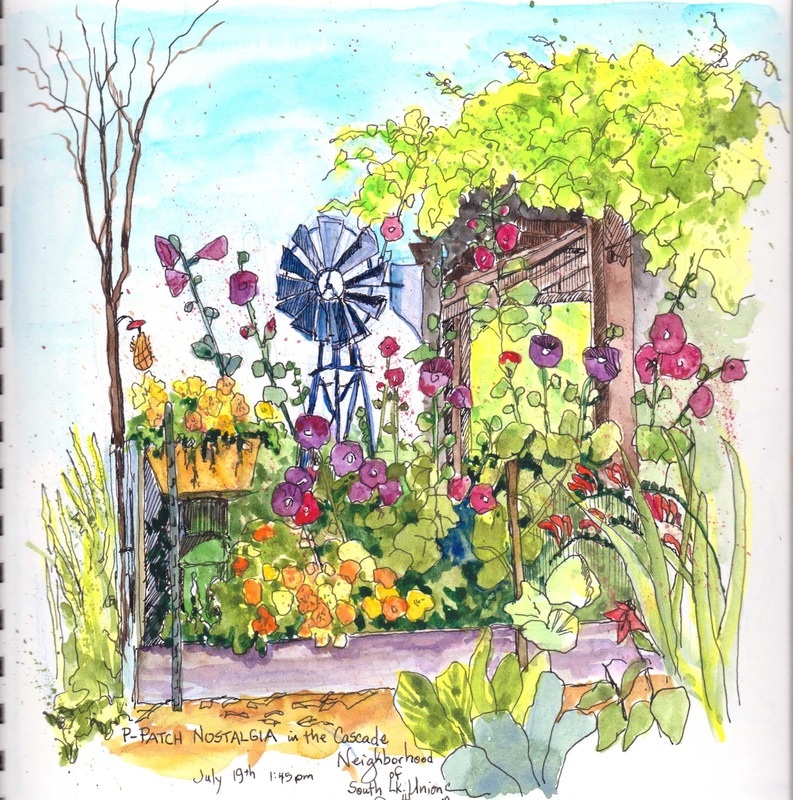 Friday was a gorgeous sunny day, the neighborhood vibrantly alive as I sat on my stool beside the P-Patch. After I sketched this scene, I walked around the P-Patch, once again promising myself I would return, SOON! Last week, several outdoor Shakespeare companies started their summer season of performances. I noted that King Lear would be performed by GreenStage Saturday afternoon in lower Woodland Park, just a mile from my home. Since the weather was so perfect, I rode my bike, packing snacks, knitting, and oh, yes, my sketchbook. What an incredible performance!! For almost 2 1/2 hours I watched, forgetting to knit at times. The characters, and costumes, and embellishments finally got me to sketching people - and people are NOT my forte! What can I say? I will, however go back to another performance and attempt the (almost) impossible!! 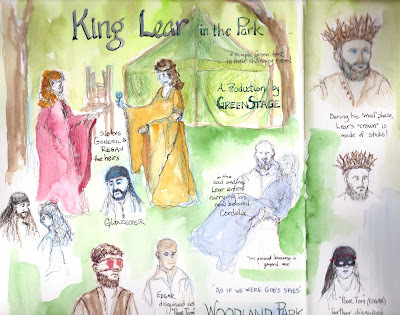 Peggy--We really like your sketch of King Lear! Would it be OK with you if we used it in an upcoming e-newsletter? Please contact Greg@GreenStage.org. Both sketches are good but I REALLY like the pea patch! Love the garden. So colorful!